This book is one of 3 in a series by Daniela Turudich, all of which should be in your book collection if you have an interest in wearing 1940's fashion. The other two are Vintage Wedding and 1940s Hairstyles, both of which are reviewed elsewhere on this site. 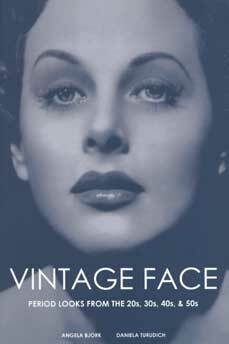 Vintage Face is a guide to women's makeup (sorry men) and the way it can be used to create a variety of different effects from the 1920's to the 1950's. Tips on how to make the best use of makeup, typical colours, different looks from that decade and vintage makeup recipes are all included. Also included are original photographs that illustrate each style and diagrams where applicable, be it eyes, lips or even nails. The book has 87 pages and although written in America is well worth purchasing. Just looking at the photographs and comparing styles and how they are achieved is well worth an evening curled up in front of the fire. It is however a very practical book, not meant for just reading but for actually using.